Fill Empty Bowls on March 5! 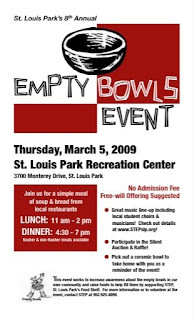 The Empty Bowls event to benefit our local food shelf is Thursday, March 5 at the St. Louis Park Rec Center. A simple meal of soup and bread from local restaurants will be served that day. Lunch is from 11:00 a.m. – 2 p.m. Dinner is from 4:30 – 7 p.m. There is no admission fee, but free-will offerings are suggested. Besides food, there will be music, a silent auction and raffle and everyone who attends can pick out a ceramic bowl to take home as a reminder of the event. The event works to increase awareness about the empty bowls in our own community and raises funds to help fill them by supporting STEP, ST. Louis Park’s Food Shelf. For more information or to volunteer at the event email Kate. IMPORTANT!! STEP WILL BE MOVING!! If you are interested in volunteering with the move, please email Kate. Daytime, evening and weekend hours are available. Volunteers must be at least 16 years old to help with STEP’s move. Also, while STEP will accept food donations until March 5, no clothing donations are accepted from now until they re-open in the new location on Monday, March 16.